What are the causes of dry scalp? The reasons for dry scalp can be many. It is important to properly recognize the factor causing the discomfort, because it determines the therapeutic treatment. Many people complain of itchy scalp in the summer when the scalp is exposed to sunlight. The problem may also become more acute in the winter when we wear hats, and there is frost and dry air outside. Both too high and too low air temperature can make the scalp dry. Pruritus of the scalp is a sign of excessive moisture loss. 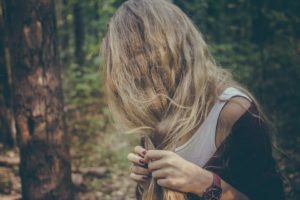 Itchy scalp may also be a disorder caused by aggressive shampoos with a very chemical composition and high alcohol content. Adverse effects on poor quality skincare cosmetics, such as hair conditioners and thermo protective products, adversely affect it. Very dry scalp is also the result of frequent drying hair dryer, long-term staying in air-conditioned rooms, using curling irons and thermolokes, which we touch the scalp, using a large amount of varnish and hair styling agents, frequent dyeing and bleaching hair. Sometimes the cause of dry scalp may be psoriasis or other dermatological disease, so if you notice a problem with the scalp, and the previously mentioned factors do not concern us, please contact a dermatologist or trichologist. How to dry your scalp – how to moisturize the scalp? If the cause of dry scalp is not a dermatological disease, first of all change in daily care. The pearl shampoo with a heavy consistency should be turned into a delicate, herbal or specially designed for the care of sensitive scalp. Do not use alcohol-containing shampoos, especially alcohol denat and isopropyl alcohol. This type of preparations should contain as many natural ingredients as possible. Moisturizing and nutritive properties are exhibited, for example, by aloe vera. It is important that the shampoo formula also contains vitamin B5, which strengthens the hair and prevents split ends, which is a common problem with dry scalp. It is worth to limit hair drying with a dryer and let them dry out once in a while and invest in a cool air dryer. If possible, also reduce the use of styling agents. The scalp should be moistened once in a while, using professional treatments in a hairdressing salon, such as a sauna. In the case of dermatological diseases of the scalp it is necessary to start treatment with the preparations prescribed by a specialist doctor. Sling the scalp – a sign of dandruff – how to get rid of it? If the persistent itching of the head does not pass, despite the longer use of moisturizing preparations and the restriction of the use of thermal devices, it may mean dandruff. It is a disease of the scalp, which consists in exfoliation of the horny layer of the epidermis. We can distinguish two types of dandruff: dry dandruff and greasy dandruff. Both cases are caused by the same fungus, Pityrosporum ovale. Dandruff fat occurs when the scalp has a tendency to become greasy. The owners of sensitive and delicate scalp are more likely to complain of dry dandruff, which can cause even badly chosen drying cosmetics for hair care and styling. In both cases, it is best to reach for special anti-dandruff shampoos that are available at any pharmacy. They contain, among others salicylic acid, ketoconazole, zinc selenium, which have the task of eliminating colonies Pityrosporum ovale.Taka treatment should last several weeks, it happens that at this time the problem of dandruff may temporarily increase. However, if you do not notice improvement after prolonged use of the shampoo, you should go to a dermatologist. It may be necessary to take oral antifungal drugs.